Dear Parents, Students, and Friends of Sanborn Regional High School. It is our last official week! Here are your important announcements for the week: 1. For those of you who were able to attend, we had a fabulous graduation ceremony to honor our 178 graduates on Friday evening. Although the weather forced us indoors, it was a night that will not soon be forgotten. 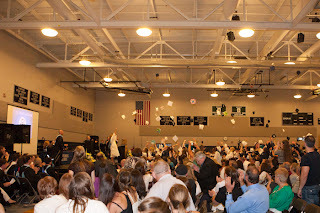 If you would like to read more about graduation, visit my blog here: http://srhsprincipalsblog.blogspot.com/2012/06/congratulations-to-class-of-2012.html 2. Over the summer I will be taking off parents of children who are no longer in our school (they graduated). I promise I won't keep spamming you folks every Monday! 3. Did you know we now have our very own PTO? Please consider joining. The membership form is attached. 4. The last day of school for underclassmen is June 13. Final Exams will be held on June 12 and 13 for underclassmen. A bell schedule for exams is attached. Please share this with your child.